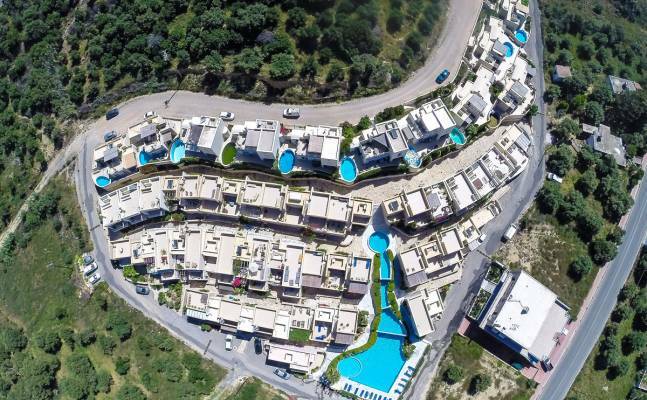 56 Houses & Apartments with fantastic views of the Libyan Sea. 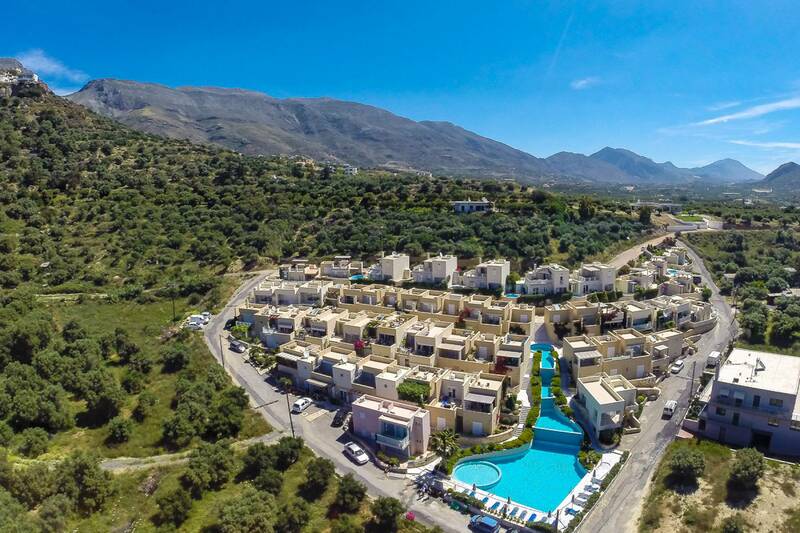 Plakia Panorama development is located on the south coast of Crete, 35 km from Rethymno and just 600 metres from one of the largest beaches in Crete. 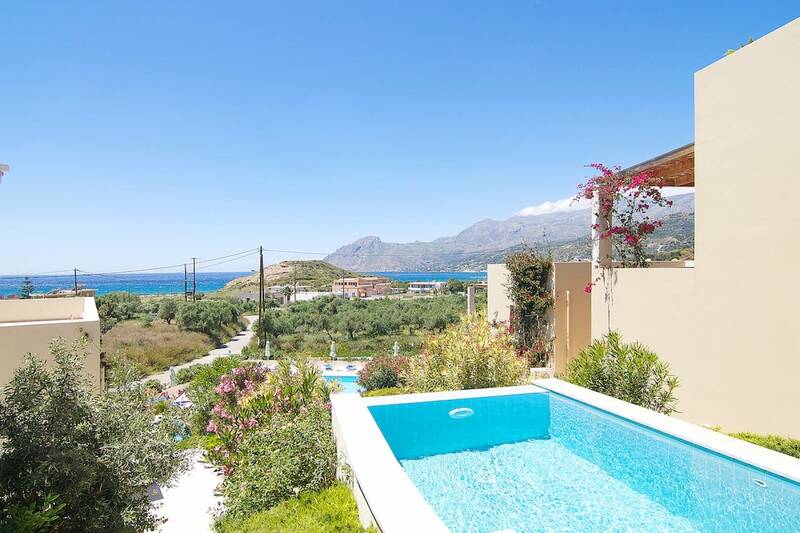 The picturesque village of Plakias is just a 5 minute stroll away. There are also other beautiful beaches nearby at Damnoni & Amoudi and a little further away is Schinaria, the preferred beach of scuba divers. 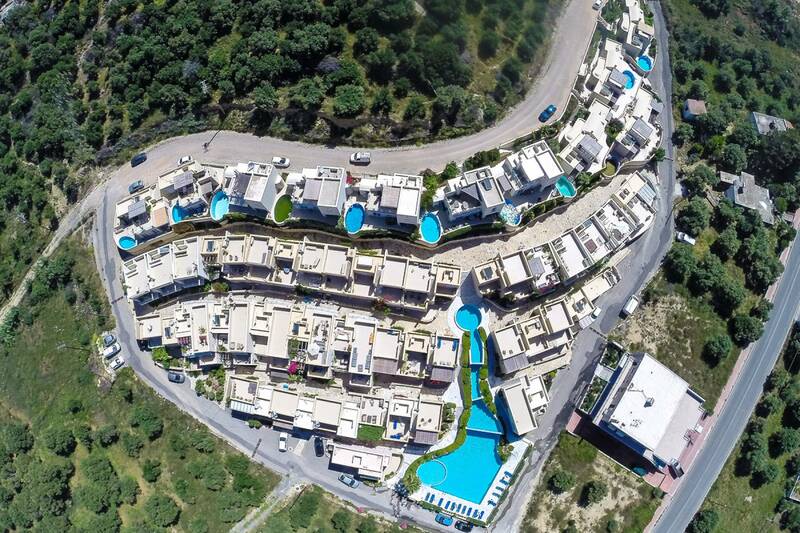 Plakia Panorama is a cleverly designed Mediterranean style village that follows the natural inclination of the land thus ensuring that all the houses boast a panoramic sea view. 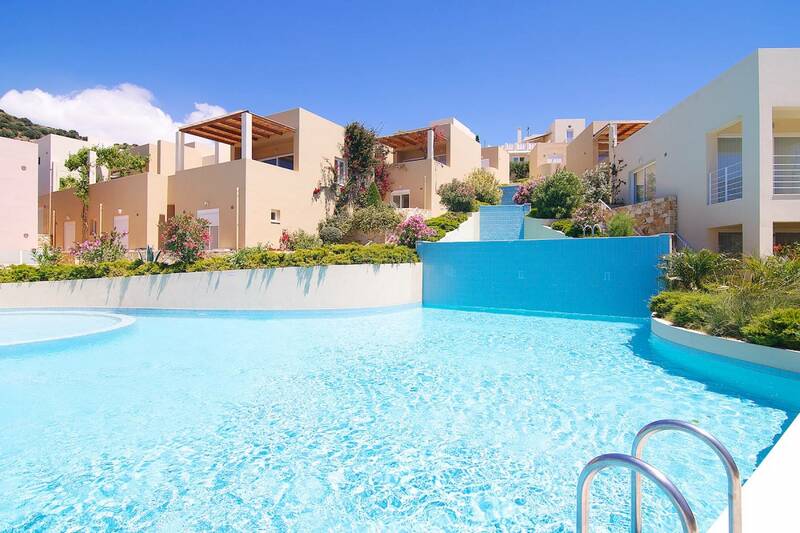 These delightful properties are equipped with both floor heating and air conditioning. All houses have either access to a roof terrace or a private garden, with some of the properties having both. There are private and communal parking areas. 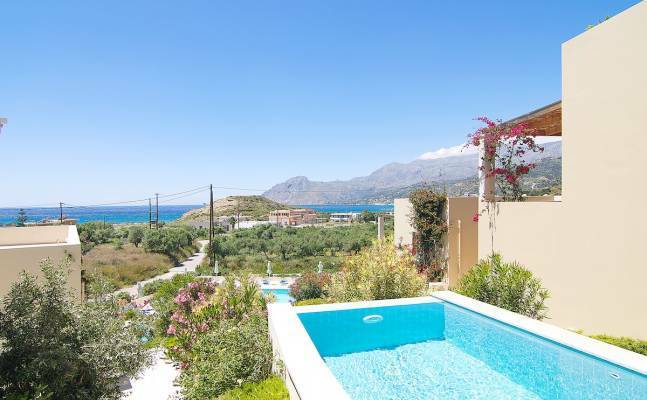 The 100 m² villas have a high degree of privacy and are located on the highest elevation of the plot giving a particularly spectacular view of the surrounding seascape & impressive mountains. 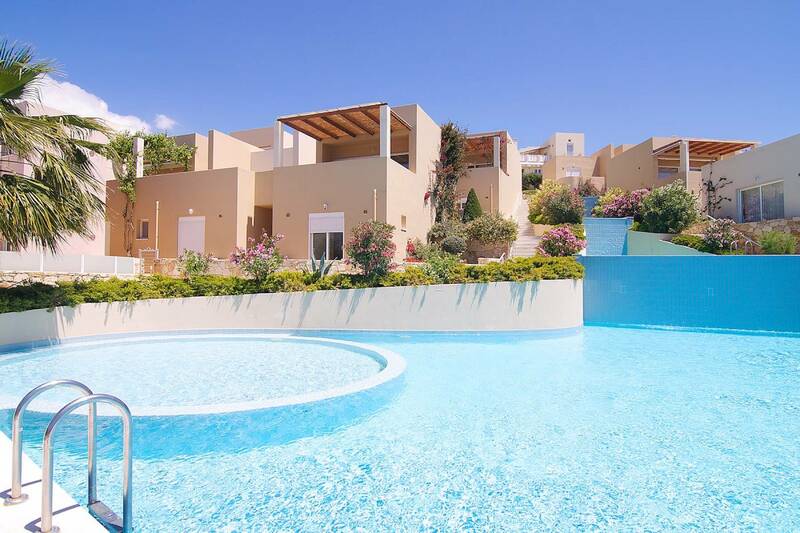 Each villa has its own oval-shaped private swimming pool. The one or two story houses of 40-70 m² have the use of the large communal swimming pool with its unique multi-level waterfall feature, which when the light hits it creates a magical atmosphere. • Exterior walls: Thermo block material with the insulation. • Interior walls: Basic one layer bricks, Plaster are set in three layers. • All internal floors will have Ceramic tiles. Patio will have earth colored and polish concrete. • All windows and doorframes will be of aluminum, The windows in all bedrooms will have external rollers. • External door will be of aluminum with a security lock. • Internal doors will be of pressed wood with locks and handles. • In each bedroom there will be a wardrobe cabinet in pressed wood. • The internal walls and roofs will be painted with acrylic paint, off crème color. • Sink, toilet, and shower corner. • Bathroom interior with mirror and cupboard in pressed wood. • Kitchen in pressed wood. • The kitchen will be delivered with cooker top, stove and extraction hood. • Porcelain tiles between work desk and cupboard. • Hot water is produced by electrical water heater. • Fuse box in metal with automatic fuses. • Separate fuses for oven, water heater and floor heating. • All houses have an exterior doorbell. • Double telephone jacks in bedrooms and living room (ISDN). • All apartments are prepared for television i.e. cables and jacks installed. • Fireplace in all 70 and 100 m² houses. • Air-condition units will be installed in each bedroom. The pool is approximately 270 m². • The area around the pool will also be covered with earth colored and polish concrete, and lawn. • The gardens will not be worked up. • The houses will be surrounded by low stone walls. • Each house will have parking. • The guarantee for the structural elements of the building is according to Greek law. For the decorative material and non structural elements is one year. • Individual adjustments might be possible. Such adjustment only after written confirmation from the client. 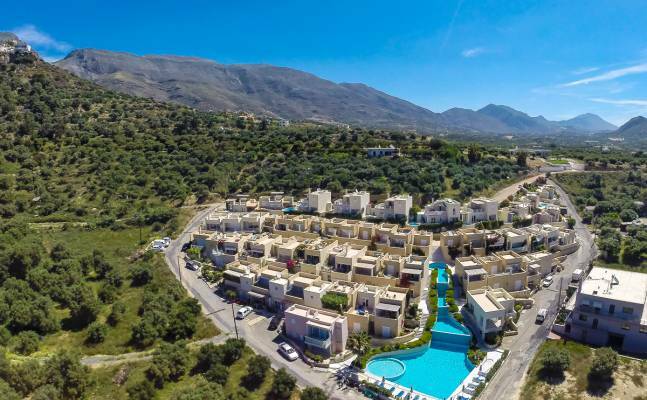 The village of Plakias is situated on the shore of the Libyan Sea. 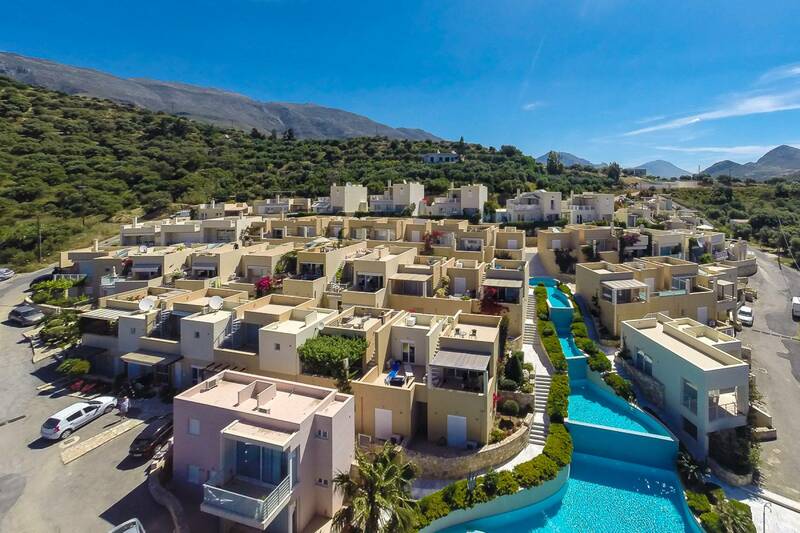 The distances to the three main towns of the island of Crete are as follows: Rethymno 35 km, Heraklio 110 km, Chania 90 km. Sunshine during most months of the year guarantee most agreeable holidays. Enjoy the sun, the sea, and the clean 1300m long sandy beach. The town is built along a single street, which runs by the beach. Follow this street, past the small harbour where you can take a boat to several other beaches. There are some wonderful walks, through the olive groves and hills beyond. The local people are friendly and hospitable. They continue to live their traditions and customs; they speak their cretan dialect and love their Cretan music and dances. 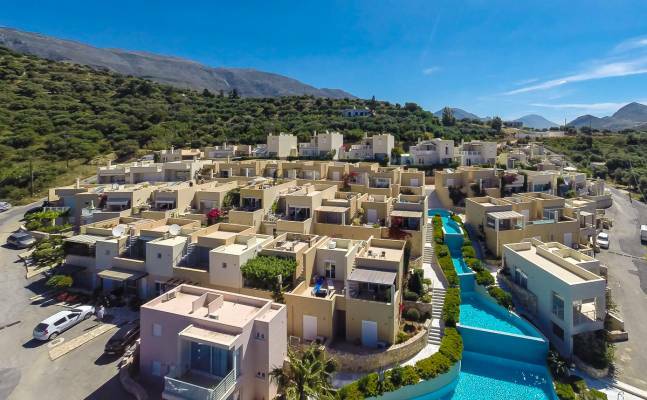 You can relish the traditional Cretan cuisine, which is based on fresh and local products and of course on the ubiquitous olive oil.Rest assured that Plakias is a safe and friendly place to live, as indeed is the whole of the island.